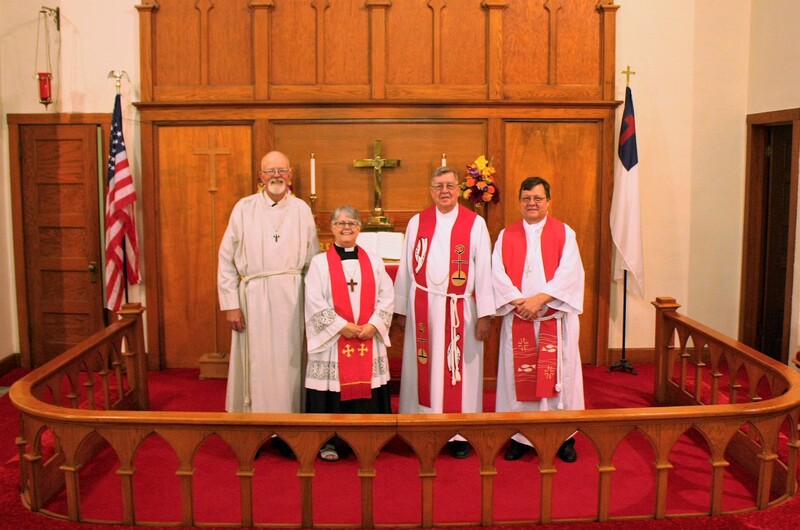 Salem Evangelical Lutheran Church, Axtell, KS, a Lutheran Congregation in Mission for Christ, installed its pastor, the Rev. Cynthia Cone, at a special worship service on Saturday, August 25th, 2018 at 2 p.m.
Pastor Cindy comes to Salem Lutheran through our Church’s Pastoral Call after serving as Associate Pastor at Salem Lutheran Church in Fremont, NE. She earned her Master’s of Divinity degree from Luther Seminary, St. Paul, MN and has been ordained 21 years. Pastor Cindy has been rostered with Lutheran Congregations in Mission for Christ since 2009. The presiding minister at the installation was Rev. Thomas Sahl, the District Pastor for Lutheran Congregations in Mission for Christ, the Heartland District, and resident Pastor for St. Paul Lutheran Church, Palmer, KS. She and her husband, Ron, have two adult children whose families live in Missouri and Texas. Pastor Cindy has a unique skill set and a diverse theological background that she brings to this ministry. She grew up in the Kansas City, MO area and is working in her second career as a Called Pastor. She has served Churches in Nebraska, Iowa, Arizona and now in Kansas.